The Lakeridge girls basketball team took a very important step forward in 2017-18. Coming off a three-year stretch that had seen the team go 0-48 in the Three Rivers League play and just 7-62 overall, the 2017-18 season was unquestionably better. Playing under first-year head coach Jason Brown, the Pacers went 5-11 in league play (11-14 overall), snapped a 53-game TRL losing skid and eventually reached the Class 6A Play-In round. Now, in Brown's second season, Lakeridge wants more. "We expect to finish in the top half of the league and we'll do so by playing full games, not just a good half," Brown said. "(But) we will have to take care of the ball and play as a team every game — all things we can and will control." 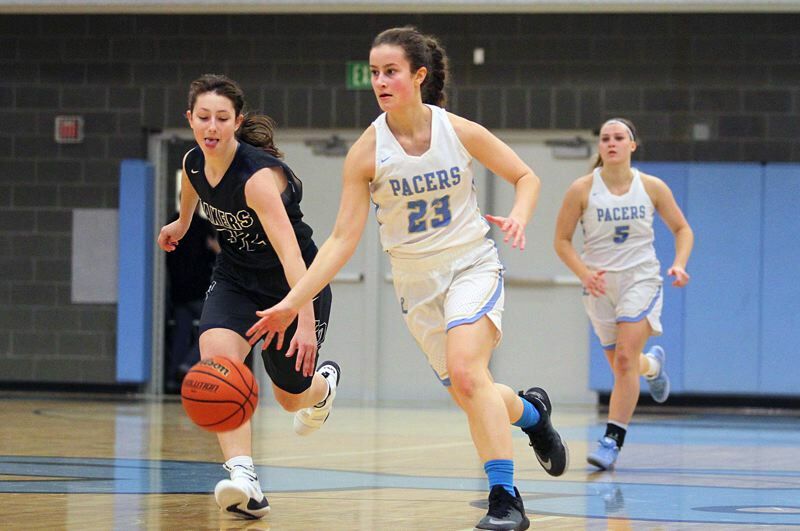 This year's Pacers will be led 5-foot-8 senior wing Brooke Clinton (a team captain who was named to the all-Three Rivers League honorable mention team last year), 5-7 junior guard Abbi Fedrizzi (another captain), 5-9 sophomore guard Addie Reardon and 6-0 senior post Kendall Thornburgh. "Brooke leads by example every day in practice. She's always the hardest worker we have," Brown said of Clinton. "She is also our most vocal player and does a great job of bringing us back together when things get tough." Brown said he expects that Clinton's outside shooting and improved overall game should make her even more effective in her senior season. "Her deadly outside shot was trouble for a lot of our opponents last year and she's really worked on her game this past offseason," he said. Fedrizzi, Brown said, "runs the point for us a lot and does a great job of getting us into our offense, and then also of pressuring the ball on the defensive side. We're expecting a breakout season from Abbi this year as she looks to score ... more herself." Lakeridge is also expecting big things from Reardon — the team's sixth player a year ago — and the improved Thornburgh. "(Reardon) is a very aggressive, physical player who plays very good defense and attacks the basket extremely well. We're very excited to watch her continue to grow as a player," Brown said, adding that Thornburgh "comes into this season with new confidence and the desire to help us win games. She can change a game with her defensive presence, rebounding and finishing around the basket." Also ready for varsity time this season are 5-7 sophomore guard Payton Moffenbeier, 5-5 freshman guard Reese Ericson, 5-11 freshman post Kiersten Weiler, 5-7 sophomore wing Keely Lipp, 5-9 sophomore wing Rose Daniels, 5-7 sophomore guard Emma Krauss, 5-9 senior post Julia Fennell and 5-7 sophomore post Lily McGinley. "We're also very excited for our two freshmen and several other sophomores who will bring us great speed and energy on both ends of the floor," Brown said. The Pacers know, however, that there are no easy wins and no nights off in the ultra-competitive Three Rivers League, where both West Linn and Tigard advanced to the Class 6A state tournament a year ago. "Tigard has won the league for several years in a row now, and should be in the hunt again, along with West Linn," Brown said. "We'll hope to have a few big wins to put ourselves in a good position as well." • To read the Lake Oswego girls team preview, click here.